Finest Italian foods from a Northcote girl with an Italian heart !! The Tiny Italian Deli gives delicious heart to Battersea! Its here...from tomorrow (22nd October 2011) on Battersea’s Northcote Road...a great new market stall to delight your taste buds, continuing a scrummy family tradition! You must all remember the wonderful Salumeria Napoli? - the legendary Italian deli on Northcote Road run by the unforgettable Salvatore Maggiulli (see picture at bottom of this page). Well since its recent closure, the long running family business is moving to pastures new. Not in the form of a new shop, but a new stall, a tiny Italian stall. And luckily for you...it's just across the road! The Tiny Italian Deli is a new venture between Hamish Johnston and Paola Maggiulli, Salvatore’s daughter - its is a brand new stall selling simply the best in fresh Italian food; handmade tortelloni, delicious pesto, Tuscan sausages and more. Paola promises to uphold her father’s excellent reputation of selling the finest of Italian foods and she will certainly give her father a run for his money when it comes to his famous, friendly chat! So there's no longer a reason to miss out on your favourites, Phew! We wish Paola and all of her team every success with this yummy new venture! Come and find them, outside Hamish Johnston...the cheese centre of Britain! So, huge thanks & love from Battersea to The Tiny Italian! 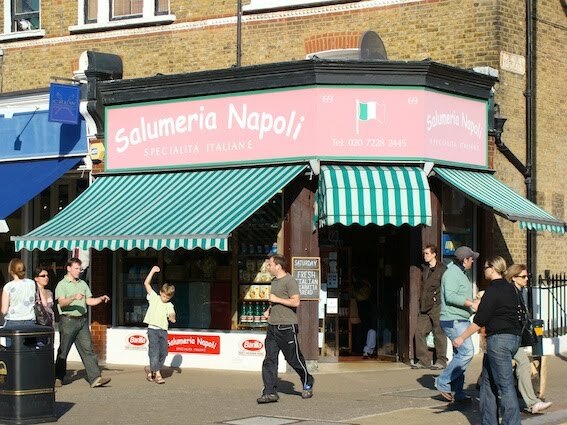 Here's a memory of one of Northcote Road's classic shops - Salumeria Napoli, whose traditions are now continued by the same family, through the start of The Tiny Italian Deli.